Demon paperwork in the modern office! Of all the contributions that historians can make to contemporary public discourse, I think that reflective skepticism about declension narratives is one of the most important. Historians define “declension narratives” as any story of change over time that trace a secular decline, decrease, or deterioration in a historical phenomenon. In other words, a declension narrative is any story we tell about something getting progressively worse (not just different) over time, in a non-cyclical way. Once you become aware of the existence of declension narrative, you’ll begin to notice that they’re everywhere in our culture. Two places I notice them all the time are in the discourse of generational change (check out ANY article about the so-called “millennials”) and in any discussion of the liberal arts in modern society. Professional historians are, as a rule, instinctively skeptical of declension narratives. It’s not because nothing ever goes into decline, but because it is often incredibly difficult to distinguish genuine secular deterioration from cyclical historical processes or from simple historical change over time that produces a world that is just different, not worse. To label a later world worse than an earlier one is to engage in a radical act of judgment, one that should be approached very carefully and modestly. If it is difficult for historians to identify and label true decline, then it is doubly, triply, or even infinitely more difficult for contemporary observers to do so. This is a tough lesson for lots of people to hear, because the temptation to see our modern world as fallen compared an earlier, simpler, better time is almost overwhelming. Declension narratives seem to get more compulsively appealing as we age (I’d love to discuss with a psychologist friend at some point why this is), but young people aren’t immune, either. Fighting this almost instinctive attachment to declension is one of the most important barricades historians can die on, I think. This film is an obvious declension narrative at its deepest level of structure: paperwork used to be manageable, but something happened, and now it’s not. It uses this sense that the modern world is worse than the past to sell some awesomely beige and clunky office equipment. It is also, from our point of view, completely ridiculous. 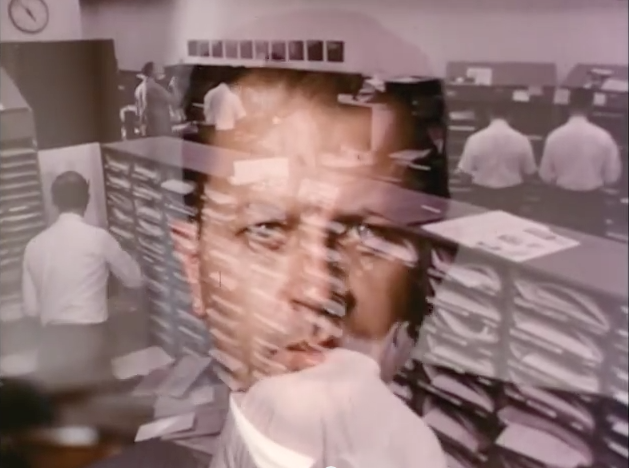 Paperwork in the 1960s was so bad that it destroyed business? Paperwork in the 1960s was worse than today? Those clunky mechanical machines somehow made paperwork easier? All of it is pretty hard to take seriously. And let this be a lesson to us all: our declarations that the world is going to hell are going to look just as ridiculous in half a century’s time. Thank you for posting this. I’ve always had the sense that these narratives were nonsense, but I’ve never really dug into. I plan on sending this to anyone who makes a “things were such much better in the good old days” statement.